Low bargaining power with bigger players like Google. …and like all industries, there are possible high risk factors too. Substitutes, competitive, low switching costs but it’s still a great investment opportunity for small to medium investors. Here are few reasons and ways to excel. There is More Money Now. Search Engines and Advertising are the Brad and Angelina of E-business. Most of the advertising is still done through Search Engines and Social media. 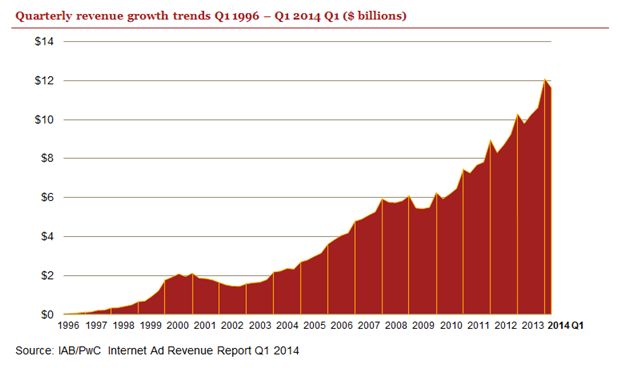 Digital Advertising expenses have increased drastically in the past decade and it will only increase in the future. Businesses across the nation are spending less of their marketing budget on other mediums and they are moving a larger budget to digital advertising. You can be at the receiving end of it too. It doesn’t matter if it’s on a laptop, desktop, mobile phone or a tablet, digital advertising is here to stay and so are information services. With a slow & weak recovery for advanced economies, difficult investment opportunities, rising commodity prices, diverse revenue source requirements & unstable job industry, an E-business such as Search Engines is a viable investment opportunity and these factors are less likely to affect this industry. Don’t fight Google. Find your Niche. You can’t win that fight. I would like to clear my throat and say “Forget About it” with my best Brooklyn accent but the big players don’t mind you there actually. In fact, they allow you to buy their results (APIs) for your site. Searches results of Google and Bing can draw results across wide topics and that’s not always what users want if they are looking for specific information either in niche industries, topics or very specific product results. Combine the results of many and filter them to offer your own uniqueness. Now, you can advertize accordingly too. You have a better knowledge of your target market. Finding a niche is very important here. You have to give them a reason to use your search over Google or others. You can alter the results that pop-up on pages. It’s not just banner advertising on the side of the page. You can promote your own other pages, blogs and businesses or others who pay for that privilege. With custom results, you can alter the results greatly with different keyword triggers. You can have more data on your users and their internet behavior & browsing patterns when you let them use a social media log in or from your own database. Let them also share your results and links on their social pages. You can do this without invading privacy and breaking ethical boundaries. Pull a Yahoo on the industry. Combine, search, articles, weather feed, mail, RSS feeds and bring ti all under one log in. Boost up-and-comers and their articles. Monitor trends. Stay on top of it all. Offer a platform for people to succeed and of course, advertise the bejesus out of it. The start up process of setting up a Search Engine or most E-businesses for that matter have become much easier. It can be done without advanced coding skills. Businesses exist to facilitate entrepreneurs with software and Scripts to pursue their dreams. Over time, as your website gets a higher rank, value of your advertising spaces goes high. You did this all in your pj’s from the comfort of your own home and you have spent more time with your family. If this all goes south, you walk away with little loss.